Allison needs to ace her presentation, but the stress of her job is giving her panic attacks and the only solution is to find a relaxing hobby. Allison always gives 100% and goes full tilt with anything she does and her new ‘hobby’ is no different. She’s always loved the water and she lives in California so surfing is a natural choice. First she has to convince the zen surfer Sean that she’s ready to hit the waves and that he should teach her. Sean has his own set of problems though, like losing his job and his apartment. He can’t get Allison out of his mind and she can’t give up her job or the surfing. We all know that person who is always busy and when you ask how they’ve been they tell you, “busy.” I, myself, succumb to this contemporary phenomenon of busy = successful. For Ali, busy is a way of life, ingrained in her very soul ever since she was a kid. Her family thrives on busy and stress. Allison doesn’t know anything else, but when her panic attacks start taking over her life, she must change or potentially die of a heart attack. If Ali can decide to relax and find something that helps her to relax, then any of us can too. If Ali can acknowledge that being busy and stressful doesn’t always make her happy and isn’t what she wants out of life, then there’s still hope for the rest of us. This romance built up slowly and steadily through the mutual attraction between Ali and Sean. The pacing was excellent and I was stressed and anxious right there with Ali. 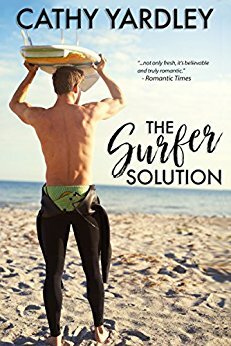 I loved all the details of Ali at her job and when she was learning to surf. I feel like I learned more about surfing by reading this book! This novel was published by Amazon Digital Services LLC on February 2, 2017 and is available on Amazon here. ← All About the Donuts – Future Donuts – Seize the Donut – Pre-order now!